Colleges play a vital role in teaching students the basics of entrepreneurship while providing support through competitions, experiential learning opportunities, mentorships, accelerator programs, and startup labs. Most importantly, many schools provide a network of alumni who may want to mentor or invest in these students. The best colleges for startups are primarily located on the East and West coasts. The heart of West Coast entrepreneurship lies in Silicon Valley, spreading north to Seattle and south to Los Angeles. Boston, New York, and Philadelphia make up the majority of the East Coast hubs. About half of the schools on our list are located in these six areas. In order to foster connections with coastal industries, some inland schools offer entrepreneur-focused campuses on the coast, while others offer internship opportunities or summer programs in those locations. Most of these entrepreneurial programs are offered by large research universities or Ivy League schools, as they often possess the business, engineering, and liberal arts programs needed to stimulate the flow of ideas. These schools also tend to boast influential alumni networks. Based in the heart of Silicon Valley, Stanford University holds strong ties with the tech community, producing influential entrepreneurs and business leaders. The school's Center for Entrepreneurial Studies began in 1996 through a partnership between two faculty members from the graduate business school. The center addresses the need for greater understanding of issues facing entrepreneurs and the entrepreneurial community. It also promotes research and offers a variety of experiential learning opportunities that prepare students for leadership roles in business. The program boasts innovative opportunities like startup garage, where students create and test their own startup ideas, and the Stanford Venture Studio, where students learn from seasoned entrepreneurs, collaborate with peers, and present their ideas to investors. Notable startups to come out of the school include Instagram, Trulia, and StubHub. Harvard University’s Arthur Rock Center for Entrepreneurship, known informally as the Rock Center, provides a hub of entrepreneurial activity and networking for MBA students and alumni. The Rock Center helps students and alumni use the school's resources to create a successful startup. Because of the school's immense amount of support and active alumni networks, more than half of its graduates go on to start their own ventures. Boasting a world-class faculty, students in the business school study case histories to understand why some startups succeed while others flop. Students participate in annual venture competitions and have access to an innovation lab that offers workshops, a space for testing ideas, and professional support. Students with a developed plan can submit their idea to the Venture Incubation Program, which helps students realize their nascent venture goals. Recent notable alumni include Matt Salzburg, creator of Blue Apron, and James Reinhard and Chris Homer, creators of ThredUp. By the end of 2014, MIT alumni had started an estimated 30,200 companies that employed 4.6 million people. As a whole, these companies generated $1.9 trillion in revenue that year, which was more than the world's 10th largest GDP, India. The Martin Trust Center for MIT Entrepreneurship provides expertise, support, and connections for students. MIT also hosts a $100K Entrepreneurship Competition, one of the top business-plan contests in the world. MIT offers platforms for students who want to launch their startup idea. These platforms include MIT delta v, an on-campus venture accelerator program, and the NYC Summer Startup Studio, a summer program that puts students in contact with New York-based industries. Graduates join a rich pool of alumni, including Elliot Cohen, creator of PillPack, and Frederic Kerrest, who helped found the multi-billion-dollar company Okta. The Berkeley-Haas Entrepreneurship Program offers world-class entrepreneurship education and scholarly research. The program supports students through experience-based learning opportunities and aims to connect students to the Bay Area's vibrant entrepreneurial ecosystems. Each year, the center hosts the Berkeley Entrepreneurs Forum, where UC-Berkeley students, along with members from the general community, meet and talk with professional entrepreneurs and venture capitalists. The program also offers an elite venture accelerator program called LAUNCH. Founded by two Berkeley-Haas MBA students, LAUNCH chooses 24 of the most promising startups each year and helps bring them to fruition. Students can take advantage of pitch a thons, industry mentors, internships, startup seed funding, and a vast network of active Berkeley alumni. Founded as the world's first collegiate business school in the late 1800s, Penn's esteemed Wharton School, based in Philadelphia, also operates a San Francisco campus. Located 40 miles from Silicon Valley, Wharton-San Francisco draws many of its students from the region. The campus boasts a hub for entrepreneurial activity with an active alumni population of more than 13,000 people. Wharton-SF offers a Bay Area Accelerator, a four-month venture initiative program that takes place every fall and spring to help current students and recent Penn alumni develop their venture ideas. Participants can apply for awards and seed funding; connect with alumni angel investors; and take advantage of mentors, advising sessions, and creative work spaces. Each year, the school's Penn campus hosts a Startup Showcase, in which students compete for over $125,000 worth of prizes. Noteworthy Wharton alumni include Elon Musk and Michael Moritz. Home to the creators of companies like DuoLingo, ModCloth, and Abililife, The Swartz Center for Entrepreneurship at Carnegie Mellon University comprises a variety of programs and opportunities that provide a multifaceted approach to entrepreneurial education. The center's extracurricular and networking opportunities include a speaker series, workshops, competitions, and a boot camp to help students flex their startup muscles. Ample mentorship and funding opportunities help students secure the financial backing necessary to make their startup ideas a reality. One opportunity, called VentureBridge, connects techie students and alumni to entrepreneurs, investors, and mentors in CMU's Silicon Valley campus. The school's Olympus Incubator Program offers micro-grants, advice, and industry connections. Also nestled within the Swartz Center is the Donald H. Jones Center for Entrepreneurial Studies, which provides a variety of cross-disciplinary entrepreneurship course options and degree paths. The University of Michigan offers two paths for entrepreneurs: the Center for Entrepreneurship, part of the College of Engineering, and the Zell Lurie Institute for Entrepreneurial Studies, housed within the Ross School of Business. Both the center and the institute boast a history of influential industry leaders and innovators. These programs offer courses on entrepreneurship and a variety of programs, competitions, and experiential learning opportunities. The school offers two student accelerator programs: TechArb and the Desai. TechArb pairs students with local mentors. The Desai consists of a four-month accelerator program that helps students interested in tech-related startups network and secure funding opportunities. A highlight of the Zell Lurie Institute includes the Michigan Business Challenge, an annual competition where students pitch their venture ideas to mentors. Teams can increase their funding with each successive round. Founded in 1919 to foster business innovation, Babson University holds a reputation as a bastion of entrepreneurship education. The Arthur M. Blank Center for Entrepreneurship hosts more than 2,000 students, with 90% of enrollees taking at least one elective in entrepreneurship. The school's Butler Launch Pad offers a series of programs that connect students to entrepreneurs. The Launch Pad includes Rocket Pitch and B.E.T.A. Challenge, which are fun, competitive opportunities for students to earn money for their startup ideas. The school's Summer Venture Program offers students an opportunity to make invaluable connections and present their ideas to an audience. Since 2009, the Summer Venture Program has developed 134 ventures among nearly 200 young entrepreneurs. The school's unique Center for Women Entrepreneurial Leaders empowers female business leaders through programs, research, and events. It also offers its own accelerator lab called Women Innovating Now. The University of Chicago's Polsky Center for Entrepreneurship and Innovation builds connections between university students, faculty, alumni, entrepreneurs, and community members within and outside of the classroom. The Polsky center drives innovation and fosters new startups through programs, funding and scholarships opportunities, and partnerships. The center occupies a multidisciplinary workspace called the Polsky Exchange, which serves as a hub for startups and collaboration. At the center, students and entrepreneurs can take advantage of meeting spaces, a cutting edge fabrication lab, and more than 450 events per year, including educational programs and workshops. The center's accelerator program, the New Venture Challenge, has created 180 viable startups totalling $600 million in funding. Startups like GrubHub, Braintree, and Simple Mills began within the university's Polsky Center. The Rollins Center for Entrepreneurship and Technology (CET) at BYU fosters a supportive and nurturing space for students to pursue their startup goals. Currently, more than 140 founders provide donations and lend their entrepreneurial experience inside the classroom and beyond. The school's large network of mentors offers a venture monitoring service, which pairs students or teams of students with successful entrepreneurs. The school boasts the country's largest private student startup competition, the Miller Competition Series. The series includes three competitions: the Big Idea Pitch, the New Venture Challenge, and the Business Model Competition. Those who place as finalists in the New Venture Challenge earn a spot in the Founder's Launchpad. Here, they receive $15,000 and an office space with which to start their venture. Like many schools, Cornell infuses entrepreneurship across its campus, finding and developing a spirit of entrepreneurship within its various colleges and disciplines. To encourage entrepreneurship on campus, the school offers incubators, accelerators, labs, funding opportunities, and internship programs. Students can gather at the eHub, a collaborative working space, or apply to participate in eLab, the school's accelerator program for student startups. Students involved with eLab receive one-on-one mentorship, professional legal consultations, and can attend events with Cornell's large network of alumni entrepreneurs. Entrepreneurship at Cornell receives support from a committed advisory council of more than 100 members. StartUpTree compiles a list of startups enacted by Cornell alumni. In total, these startups have secured more than $10 billion in funding. Some well-known companies with roots at Cornell include Blackboard, Change.org, Lyft, and Wayfair. Founded in 2001, the Herb Kelleher Center for Entrepreneurship, Growth, and Renewal brings together university resources, leading entrepreneurs, innovative industry partners, students, and faculty from across campus and beyond. UT encourages and facilitates the development of successful entrepreneurs while communicating new knowledge about the entrepreneurial process. Austin offers a variety of startup resources, including investors, working spaces, maker spaces, incubators, accelerators, and several entrepreneurial and tech meetup groups. The center offers a Longhorn Entrepreneurship Acceleration Program (LEAP), in which students work with startups in underserved communities. Students can also take advantage of a monthly law clinic for entrepreneurs and regularly scheduled lunch workshops that help students develop startup skills. Every year, the center hosts an entrepreneur in residence who is available for students to contact with questions about their own startup ideas. The school also hosts the Texas Business Plan Competition, an annual event for undergraduates that offers cash prizes and helps with the development of successful entrepreneurs. NYU offers a multidisciplinary approach to entrepreneurship. The school's Entrepreneurial Institute helps students from all backgrounds and disciplines realize their startup goals, capitalizing on the ideas and technology created by NYU's more than 60,000 students and faculty. The center cultivates a healthy startup ecosystem through educational courses, programing, events, resources, and funding opportunities. Graduate students and faculty can participate in startup bootcamps, which involve half-day workshops targeted at entrepreneurs and inventors. NYU also offers a variety of funding opportunities and competitions, including a $300K Entrepreneurs Challenge. The Challenge consists of three competitions in which students compete for cash prizes and free startup services. Additional on-campus resources like the Leslie eLab allow NYU students to interact, brainstorm, and troubleshoot startup prototypes with their peers and mentors. The lab provides meeting spaces and material resources like 3D printers, soldering irons, and a variety of sensors. Northeastern’s Center for Entrepreneurship Education fosters innovative and entrepreneurial thinking across campus. The center offers entrepreneurial courses, incubators, programs, mentors, events, and experiential learning opportunities for students interested in starting their own companies. The center serves undergraduates, graduate students, and alumni, creating a cohesive, multidisciplinary commitment to innovation and entrepreneurship. Northeastern offers 37 undergraduate entrepreneurship courses, 30 faculty members from 12 different departments, and more than 150 ventures started by current students and alumni. Northeastern hosts IDEA, an annual student-run venture accelerator that helps learners start businesses. IDEA provides participants with mentors, legal counsel, marketing experts, and gap funding. Northeastern participates in Global Entrepreneurship Week. The week is an opportunity to celebrate and showcase the school's entrepreneurship resources and connect students with faculty members, mentors, alumni, and entrepreneurs in their community. Founded in 2008, the Galant Center for Innovation and Entrepreneurship encourages students and alumni from all disciplines to pursue their startup goals. Focusing on education, empowerment, and encouragement, the center supports students interested in learning about startups or wanting to bring their startup to life. The center offers two yearly competitions: the Pitch and The Gallant Challenge, both leading to cash prizes and investments. The center also hosts speakers, symposiums, festivals, and workshops that bring people together to make connections with their peers. For students interested in hands-on experiences, the center offers StartUp Trips, where students travel to places like New York or the District of Columbia to meet with companies like BarkBox and Etsy. UVA values entrepreneurship education. Undergraduates at UVA can minor in entrepreneurship, and selected fourth-year commerce majors can follow an entrepreneurship track. Graduate students in both the Darden Graduate School of Business and UVA School of Law may also take courses in entrepreneurship. 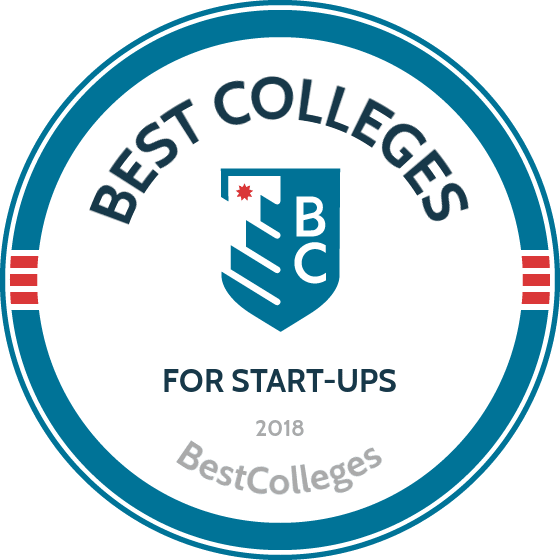 Schools are ranked according to three criteria: whether the school offers a notable business or entrepreneurial program or an entrepreneurial center, the number of notable startups created by alumni, and the amount of support offered. The highest-ranking programs have broad-reaching, well-funded, and vibrant centers for entrepreneurship that consistently produce successful alumni. These schools provide support through funding, mentorships, and education and offer opportunities for students to bring their startup ideas to commercial fruition.